Store in a container with tight fitting lid. Label and date contents. and tape directions below to container. Store in pantry use within approx. 2 months. Put water and butter in a saucepan. Over medium heat, stir until butter is melted. Use a whisk to stir in gravy mix. 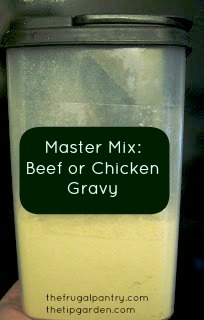 Stir constantly over medium heat until gravy is smooth and slightly thickened, 2-3 minutes.